Fig. 85 C3 and C4 plants . 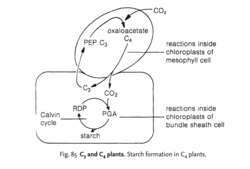 Starch formation in C4 plants. a grouping of higher plants, related to the carbon content of the compound produced when carbon dioxide is fixed during PHOTOSYNTHESIS. In C3 plants (the most common type), carbon dioxide combines with 5-carbon ribulose diphosphate to produce two molecules of 3-carbon phosphoglyceric acid (PGA). In C4 plants (e.g. maize), there is a special KRANZ ANATOMY in which mesophyll cells are adjacent to bundle sheath cells containing large chloroplasts. Carbon dioxide combines with 3-carbon phosphenol pyruvate (PEP) in the mesophyll cells to form 4-carbon oxaloacetic acid and malic acid which are then transported to the bundle sheath cells where carbon dioxide is released to go into the CALVIN CYCLE. The advantage of using PEP is that C4 plants can fix carbon dioxide even when in low concentration in the atmosphere (as, for example, in dense tropical vegetation). The system is also used in some XEROPHYTES as a CO2 source during the day when the STOMA is closed.